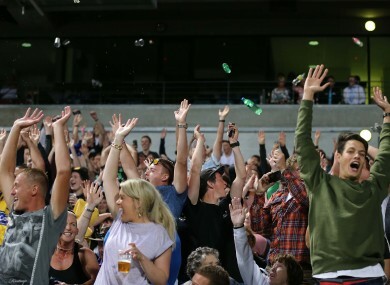 A 'Mexican wave' at the Australia v Ireland GAA GO International Rules Series in November 2014. THE MEXICAN WAVE is of course a phenomenon wherein a large group of people mimic the effect of a moving wave by standing and flailing their arms in perfect sequence, before promptly taking their seats again. It is apparently a perfect example of metachronal rhythm (look it up, it’s a thing). We’ve all been there. You’re a young kid in a packed stadium for a sporting event, and a Mexican Wave begins on the other side of the stadium. You can’t contain your excitement because, who doesn’t love a good Mexican wave? This Chicago White Sox baseball fan apparently, who wasn’t impressed by the fans’ efforts at the US Cellular Field during last weekend’s game against the Minnesota Twins, which the visitors won 7-0. Email “Video: This baseball fan does not like the 'Mexican Wave'”. Feedback on “Video: This baseball fan does not like the 'Mexican Wave'”.